Polka dot is the transitional print of the season. The retro motif became the leading lady in the print department this summer, knocking florals to a co-starring role. It seems that despite the golden hues of autumn leaves falling around us we are not ready to let go of the summer favourite just yet. To be honest I couldn’t be happier. I have always had a love affair with the style of the 50s where the polka dot took centre stage. It also calls to my style fetish of everything monochrome allowing me to indulge in two trends at once. Despite its retro heritage the polka dot is seamlessly modern. There is no fear of Minnie Mouse connotations here. Instead adding this classic print to your wardrobe will instantly rank up your style stakes. For a modern take on the polka dot forget monochrome and embrace colour. 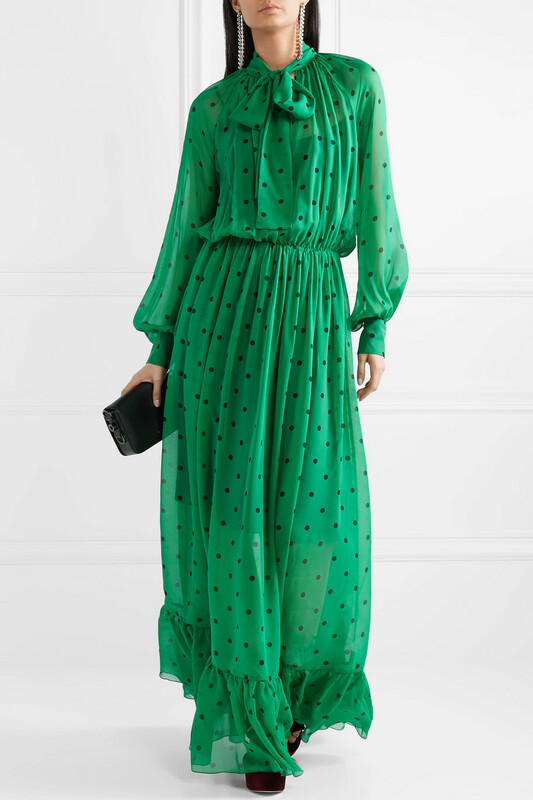 This statement piece from MSGM showcases the polka dot trend. It may be a budget buster but this is a dress that will transcend through future trends. The jumpsuit is having a revival too this season. What better way to incorporate two trends in one then with a classic monochrome piece like this one from Oasis. The mini skirt should always be an AW staple. Why? Because it’s such a versatile and easy piece to style. Match with a chunky knit, opaque tights and ankle boots (I’m currently loving the cowboy boot trend at the moment). This cord mini from Topshop will have all your style needs covered. Uterque is a Spanish brand that has recently caught my sartorial eye. It’s like a grown up version of Zara so what’s not to like? Especially when it comes to this stunning navy polka dot dress. Anybody remember Abigail Spencer wearing that Alessandra Rich dress at Meghan and Harry’s wedding? This is the perfect dupe if you’re looking for inspiration. If taking on the polka dot head to toe is a little daunting then adding just a touch is an easy way to incorporate the trend into your style. This modern sheer turtle neck would be perfectly matched under a pinafore dress (check out my last blog on this other favourite) or as seen here with a pair of high waisted jeans. Hope you enjoyed this introduction to the polka dot trend. As always I would love to hear your thoughts so don’t be afraid to leave a comment. Happy shopping!